Looking for quality GSD products for your own dog or the GSD lover? Looking for GSD products for your own GSD or the German Shepherd lover in your life? We have done all the research for you and will only share sources with you that we feel are among the best of their kind. If you see any German Shepherd product that interests you, just click on that link to view the gift! What an easy way to take care of all your dog supply and gift needs. So, with that in mind, feel free to browse through our GSD product selections and recommendations to find the perfect item for you or your dog loving friends. We will list sources for many of the GSD products you will have to have for your German Shepherd, such as food, beds and collars; and we will also list places to find those GSD products that will make owning your German Shepherd just a bit more fun as well as comfortable, such as dog insurance, health supplements, dog crates, gifts, and dog toys. If you're in the market for GSD training aids, fencing products, or grooming supplies, we'll help you with that as well. The satisfaction of our customers is always our first priority. Please let us know personally if any of these merchants give you less than stellar service. We want you to enjoy your GSD products as much as we do. German Shepherd Dog Ornaments - Beautiful German Shepherd Ornaments in all different styles - ceramic, plastic, wood - you name it. They make great gifts for German Shepherd lovers too. German Shepherd Dog Christmas Cards - Show off your favorite dog breed, the German Shepherd, during the holidays with any of a number of wonderful collection of German Shepherd Dog Christmas Cards. German Shepherd Signs - These German Shepherd only signs are very durable and also weather resistant. They can also be used both indoors or outdoors. Available in many sizes, shapes and colors. German Shepherd Books - All German Shepherd owners should have a few German Shepherd Books in their library. You can get them on health care issues, training issues and the history of the GSD too. Neater Feeder - This elevated dog feeder is a perfect GSD products. It is made out of high quality materials, comes in a few different sizes (even for cats), and features a drip tray, removeable bowls (included) and high walls to help keep everything inside. They make a great gift too for the dog owner that has almost everything. 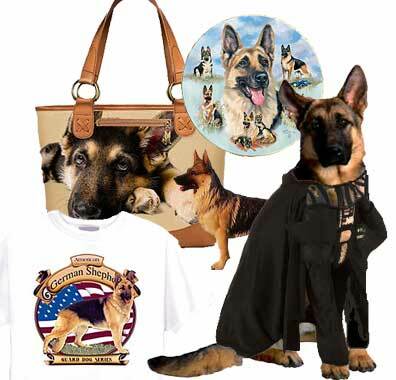 German Shepherd Handbag - This German Shepherd handbag is crafted of the highest quality materials, featuring a large image of the German Shepherd accented by real leather trim and handles. German Shepherd Prints - German shepherd prints make great gifts for German Shepherd Dog owners and lovers. 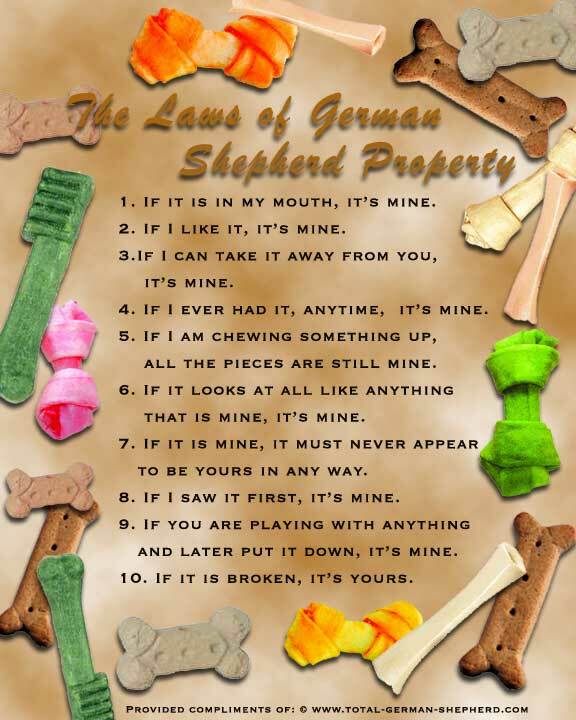 Our selection of German Shepherd Dog posters includes both GSD pictures and artwork. German Shepherd Calendars - Find a wide variety of German Shepherd 2012 calendar titles in stock (as well as many other dog breeds). We carry Wall Calendars, Desk Calendars and Engagement Calendars for every interest and occasion as well as many other GSD products. Best German Shepherd Dog Toy Ever! - These Jolly Balls are very durable and also resist deflation. NO air is needed to inflate. Available in many sizes, shapes and colors. German Shepherd Dog Collectibles - The exclusive German Shepherd only merchandise found on this page are also available in many more dog breeds other than the German Shepherd ones pictured (just in case you're interested in another breed of dog). German Shepherd Costumes - Are you shopping for any kind of dog costumes for your German Shepherd? Halloween, party or some other special occasion? Please check out what we have to offer. GSD Dog Breed Design T-Shirts - Tshirts displaying your favorite dog breed are always a favorite gift choice. Feel free to browse the selection here to find several different designs for GSD products, as well as many other breeds of dog (for all those German Shepherd "wannabees"). Included are some of the best looking dog designs for t-shirts that I've seen. Many sizes, designs and dog breeds to choose from. Dog Supplies - Chews, Toys, Etc.- Need dog supplies? See "What's New" at Total German Shepherd! Browse through our new online store for all kinds of dog necessities and products at Everyday Low Prices! We are your new source for dog travel & outdoor gear, dog foods, dog training aids, dog collars and leashes, dog bones, chews & rawhides, crates, treats, toys, bones, and more! Dog Food Products - There are several different types of dog foods on the market. Anything from Generic dog foods, to Store Label dog foods (such as supermarket brands), to Standard Brand Name dog foods (such as Purina or Pedigree). Please visit the companies listed on our dog food page for more info about the types of dog food you are looking to buy.